There are a lot of nice music suggested in previous posts. But when you are listening to jazz try also to understand what the musicians are doing. If you like to read, there are a lot of books that explains jazz, and what is going on in the music. For example. Listen specifically to the bass player, What is he (or she) doing? And the drummer. Is there chord changes or are the musicians improvising over the same key all through the tune, like in Miles Davis "So What" from Kind of Blue. The fun thing about jazz is, when you dig into it, and learn about jazz, is that you will hear the music in a new way. You understand when the musicians do something unexpected or provocative and this is a fun challenge to you as a listener. This do not mean there is something wrong with easy melodies and straightforward jazz, I am just saying that jazz is a deep well where there is a lot of things to explore that you may miss if you only stay at the surface. Don´t miss it. Well said! I think a lot of people see jazz as rather self-indulgent "noodlings", whereas it repays as close a listen as you would to a symphony or string quartet. The major difference being jazz happens at the time of the performance, of course. And like classical music recordings, it's instructive and enjoyable to get different recordings of the same piece. I must have about 20 versions pf Thelonius Monk's 'Round Midnight - some very, very different, but all giving an insight into the players minds at the time of recording. Fascinating stuff! Humboldt, thanks for taking the time to post this annotated list of books. I will be checking them out. I am currently reading "Thelonious Monk: The Life and Times of an American Original" by Robin D. G. Kelley. "today many exciting jazz records are not American", I agree, I have been checking out a lot of music from Edition Records and have found some fantastic music. Here is another great jazz record. 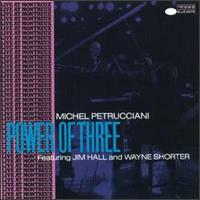 It is a remastered Blue Note release of Michel Petrucciani - Power of Three. BT 85133, BT-85133. Live and really nice recording. I've been enjoying the Basie band again recently and would love to find something with the same dynamics but with some serious Latin drive/percussion. You can sample them on the Reference Recordings website. They aren't really big Basie Band like, but have the latin drive you may like. I wish I knew more about Latin music from the big band era. All my latin related stuff is from a bit later, like Fania related stuff (Willie Colon et. al) and Cal Tjader. One of my friends was playing a bunch of albums by Sabu Martinez the other day - definitely something I want to get more into. I don't have any of his solo albums, only a couple things he's plays on. Might be up your alley.